I have never given much thought to the idea that PIXAR never had a female lead in any of their animated films. Brave is an effort to rectify this, to allow girls to have their own heroines in this male-dominated world. Brave is a good effort, and it has some beautiful aspects to it. However, I found it a great disappointment, a bit boring, and while everyone gave it their best shot it fails to be anything other than a minor PIXAR work that will eventually be merchandised away from whatever proto-feminist message it attempted to sell. Princess Merida (Kelly Macdonald) is a wild Scottish lass, the oldest of King Fergus (Billy Connolly) and Queen Elinor's (Emma Thompson) children. She loves riding, shooting arrows, a true Warrior Princess. Queen Elinor, however, spends her time telling her daughter what a princess "doesn't" do, which is just about everything Merida does and enjoys. As it stands, Merida now must marry, and Merida is furious. The clans come to claim the Princess' hand: the eldest sons of Clan Dingwall, MacGuffin, and Macintosh. As Merida is forced from her free-flowing (but still elegant) dresses to something more constrictive, she is highly angered at being married off when all she wants to do is run wild and free through the Highlands. However, she thinks she's found a loophole: the eldest child who wins at a selected competition can win her hand. As she is the eldest child, she shocks the Scots by claiming her own hand...and winning. She so infuriates her mother that Merida slashes a tapestry of her with her parents, then runs off. Merida encounters a witch (Julie Walters) who gives her the power to change her mother via a cake. Merida returns and offers an unsuspecting Queen said cake, and she is turned into a bear. From there, they find the only way to reverse the spell is to mend the bond. Eventually the clans are coming close to all-out war over Merida's acts, Merida and Mother Bear realize the value each other have, the Queen is turned back to human form and the evil bear-monster Mor'du is defeated. Truth be told by the time we discover that the Witch has gone away to some fair (and leaves the medieval version of a call center message), I lost interest with Brave. I was fighting sleep to try to keep watching, and I think it has to do with the story. Brave managed to violate one of my Golden Rules of Filmmaking: There Should Be a Maximum of Three Screenwriters. Co-directors Mark Andrews, Steve Purcell, and Brenda Chapman, along with Irene Mecchi, hammered away at a story that did two things wrong in my view. The first is that it gave us no real sympathetic characters to which we would care about. Merida was not this feisty, fiery Scottish lass. She was really this perennial whiner, constantly belittling her mother's thoughts and running to her weak daddy to side with her. In many ways, I found Merida rather unlikable: a girl who doesn't care about anyone other than herself and who thinks rudeness to her parents is a virtue. That isn't to say I found Elinor sympathetic either. She never bothered to explain to her daughter why certain things were good and others bad. Instead, she seemed determined to merely snap at Merida at the slightest infraction, almost with delight sometimes. Obviously these two would not win Mother or Daughter of the Year. One wonders why Merida would be so willing to give Elinor that cake that would change her mother. What if it had changed her into a ghost? Merida seems almost more monstrous than Mor'du, so when Elinor is turned into a bear it seems surprising given how Merida is that she wouldn't be anything but thrilled. They never showed that they liked each other, let alone loved each other, so once we get the "forced to be together" business, it all rang fake with me. In short, Brave was not subtle about Merida's rebellion from being a 'princess' in the traditional sense, and given that this is Scotland we're talking about, I do wonder why her parents wouldn't be thrilled in having a Warrior Princess. The surprise would have come from having a demure girl I would have imagined. The second mistake as I see it is that the story seemed to go all over the place. Somehow, it all was running pretty low on steam when Merida's encounter with the Witch (which couldn't decide if it was suppose to be menacing or comical) ended, so the entire bear sequence appeared tacked on. Worse, the encounter with Mor'du seemed also there merely to stretch the story and give Merida both an antagonist and a danger. Why introduce the witch if we're going to send her away? Furthermore, having her ask that if they wish to listen to her message in Gaelic, pour the second bottle into the caldron just smacks of trying too hard to be contemporary and medieval at the same time. Things like that don't appear funny...cute, perhaps, but not funny. Finally, I confess to finding Merida's voice-over more grating than informative. Of course, I'm not a fan of voice-overs in general, but in Brave, I think we could have dispensed with it altogether. I compliment Brave on being a beautiful looking film, and Patrick Doyle's highly effective Scottish-influenced score is top-notch. 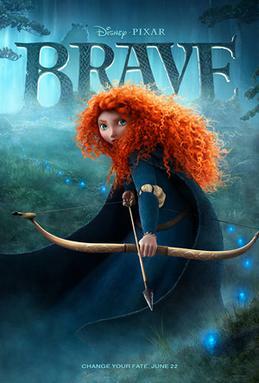 On the whole, Brave is beautiful visually and with a beautiful score, but I found it a bit dull and weak. The message that I think Brave was trying to send (Girls Can Do It Too), I figure will so be displaced with little girls dressing like the Princess, with their bows and arrows but still in lovely gowns. Hopefully they won't pick up Merida's rather harsh manner with their own parents. Kids will probably be dazzled with its look, but for me, Brave lacked the courage of the convictions it was trying to send.